For the past couple of weeks I have been posting some thoughts for different dishes folks could consider making for Thanksgiving, and this week someone wrote in, asking whether there was anything “easy” I tended to always make. The answer is, “Yes.” My go-to for any occasion, not just Thanksgiving, is a medley of roasted vegetables. It’s easy to do, looks pretty, and can be “jazzed” up. 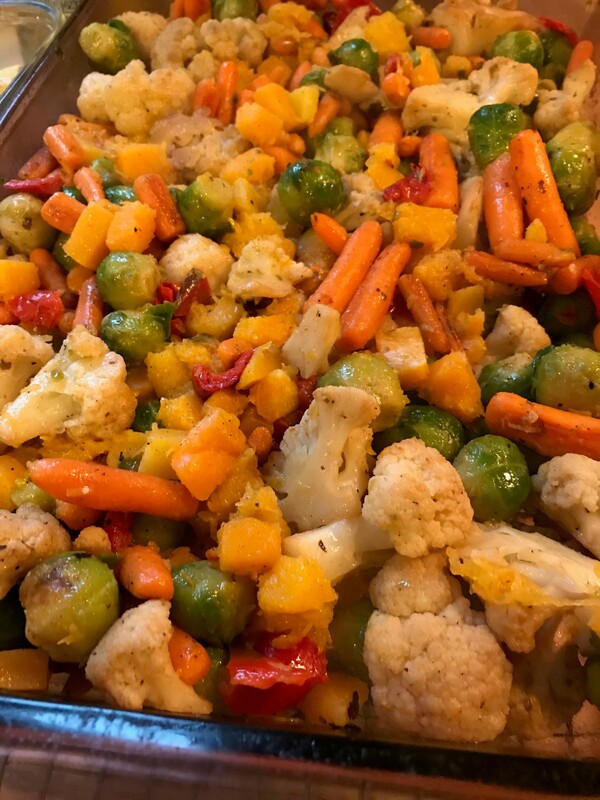 I use frozen, chopped vegetables, which cuts both the roasting and prep times, and once the vegetables are roasted, it takes just minutes to “adorn” them. Once that’s completed, the vegetables can sit in your fridge until about thirty minutes before you’re ready to eat them, at which point, you simply warm them at 300 degrees for about 20 to 25 minutes. If I am making the medley for Thanksgiving, I try to make them a bit more “special” by caramelizing onions and adding it to the vegetables or roasting garlic and adding slivers with freshly chopped herbs. Sometimes I make a gluten free bread crumb topping and top the vegetables with it. Other times, I make it “au gratin” and add vegan parmesan. Any of these options makes for a delicious side dish. For folks who are wondering about the turkey which may go with the roasted veggies, I did a post a couple of years ago which you can find at Turkey Talk and which provides some tips for tackling turkey. Arrange vegetables of the same size in an ovenproof pan and drizzled with a tiny bit of olive oil. Mix and roast in the oven for about 10 to 15 minutes, turning every four to five minutes, until the vegetables are to the desired tenderness. If you have vegetables of different sizes, you may need to do a couple of rounds of roasting, by size, until all your vegetables are done. Arrange all the vegetables in a pan that fits them well. Top with your desired method of flavoring: mixing with freshly chopped herbs and black pepper; caramelizing onions and mixing them in; roasting garlic and mixing in slivers; making a bread crumb topping and sprinkling it on top; shaking parmesan on top. If serving immediately, you’re good to go. If serving at a later time or day, simply allow the vegetables to cool, cover well, and then thirty minutes before meal time, heat the dish at 300 degrees for 20 to 25 minutes until warm.